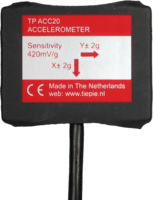 The Accelerometer TP-ACC20 is a dual axis accelerometer combined with a manual trigger button, designed to be used with the Handyscope HS3, Handyscope HS4, Handyscope HS4 DIFF (order code TP-ACC20-25) and Automotive scope ATS610004D-XMSG (order code TP-ACC20-09). The dual accelerometer is a low power dual axis accelerometer with voltage outputs. It can measure accelerations in two axes, up to ± 2 g. It can measure both dynamic acceleration and static acceleration (gravity). The manual trigger button can be used to trigger measurements in situations where no trigger condition can be derived from the input signals. The acceleration sensor of the Accelerometer TP-ACC20 is placed in a small package with a long, thin flexible cable. The package contains strong magnets to attach the sensor to magnetic (steel) surfaces without the need of screws or clamps. One side of the package contains a patch of velcro, to attach the sensor to fabric surfaces. The Accelerometer TP-ACC20 also contains a manual trigger button. This button can be used to manually trigger measurements in situations where no trigger condition can be derived from the input signals. The manual trigger button has a solid aluminum body and is fitted with a female BNC connector. A long flexible cable with a male BNC connector is used to connect the button to the instrument. The table below shows detailed specifications of the Accelerometer TP-ACC20. The Accelerometer TP-ACC20 is available in 2 models with different connectors, a 25 pin and a 9 pin D-sub connector. The Accelerometer TP-ACC20 - 09 can be used with the Handyscope HS5 and Handyscope HS6 DIFF. The Accelerometer TP-ACC20 - 25 can be used with the Handyscope HS3, Handyscope HS4 and Handyscope HS4 DIFF.